There is no better way to “get the feel” of a home before visiting than by viewing a 360 degree Panoramic tour. Our tours can be as little as a handful of views up to as many images as it takes to fully cover a home. 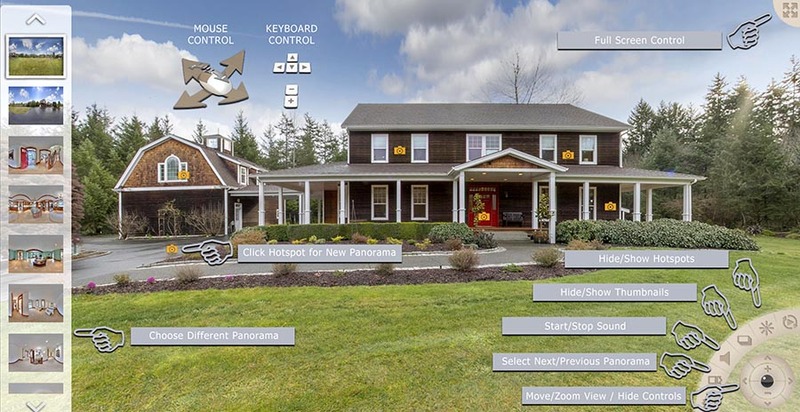 With easy to use web based viewer a prospective buyer can feel like they are standing in a home and if using an ipad can switch the gyroscope on in the viewer and by turning around can experience a “window” into the home. Looking for the very best way to utilise that “Virtual Tour” link in the MLS? Then an interactive 360 degree panoramic tour with multiple viewpoints is just what you need. Check out our examples below to see just how impressive a 360 degree tour can be and if you view on an Ipad you can use the inbuilt accelerometer to truly feel like you have a window into another dimension! Ultra High Resolution - Takes longer to capture and create. Looking for the Ultimate Tour then choose the High Resolution option which is unsurpassed by any other capture method including Matterport etc. By using a similar method to our regular High Resolution Listing photography we capture 42 Twenty Megapixel images for each panorama to produce images over 13,500 pixels wide for an incredible viewing experience. We even add in 360 Panoramic Blue Sky and Puffy Clouds when needed. Standard Resolution - Uses Fast “One Shot” capture method. $75 setup fee and $15 per Panorama. Looking to cover the Home with multiple views for the best price? Then choose our Standard Resolution tour with 5,500 pixel images. By using a remotely controlled camera that captures the 360 degree view in a single instance we can keep prices very affordable. For example a Basic 10 image tour costs just $200 and a 15 Panorama Tour is just $275. What is the Difference between our Tours and Matterport? Need the Highest Resolution and Quality tour? We offer panoramic images up to 13,550 pixels wide. Maximum size is just 8,092 wide. Typically 30 minutes or less. Typically 2 Hours or more. Tour. Average home covered for $200 or less. Limited offerings at a high price. See the full ceiling and floor. so floors and ceilings are not fully visible. using agents voice or ours. Fast easy to navigate responsive tours. Confusing slow to navigate tours. Clean no fuss tour with ability to hide all hotspots/controls. Too many unnecessary panoramas clutter the experience.